As promised, here is Part II of my recent nails. This post is actually going to be wholly about this amazing magnetic polish I had Polish Pixie get for me. 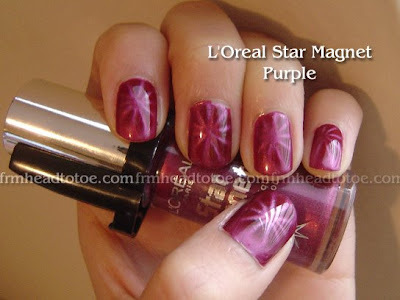 Anyone remember those really cool Lancome Le Magnetique nailpolishes that made a really cool star pattern on your nail? For those who don't remember, here is a refresher. 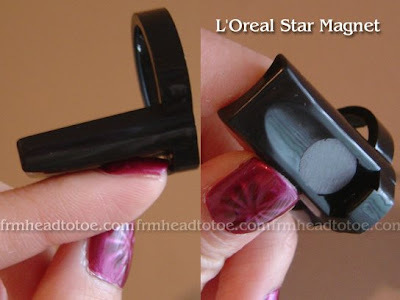 Click image for All Lacquered Up's post on Lancome Le Magnetique - Bordeaux Esmee. Posted July, 2007. Then, Lancome released a deep blue color last winter ONLY IN THE UK. What the...aksjlkasjflkajs?! Here is a photo. Click image for The Polish Addict's review, posted Feb 2009. This comes to my story. 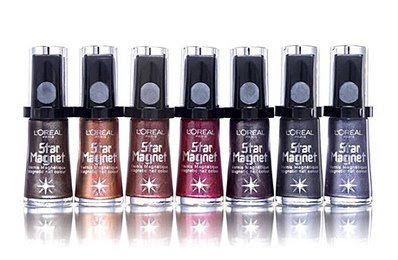 After some research I found out that L'Oréal, the company that owns Lancome, decided to release some magnetic polishes in a few European countries (and not the US or UK even T.T) last Fall at DRUGSTORES to boot, called L'Oréal Star Polish. When I found out, I started asking every European friend I had. Luckily, Inge from Polish Pixie (from whom I won the Hello Kitty fauxnad plate) happens to live in Denmark and willingly did a custom purchase for me (while also buying all of the remaining Star Magnet polishes in that store). A few colors were already sold out and apparently the store was told to ship the polishes back! I don't understand why it was only a limited edition release, but I am so happy I got my hands on 2 of them. I've only worn Purple so far, but isn't it just incredible? I had trouble concentrating on anything because I was so distracted by my nails all the time. The dimension of these in sunlight is out of this world. Here are my pics. The two polish bottles, Purple and Prune. They look more like a deep raspberry and plum color to me and they are quite small. Here is the plastic cap-ring that has a circular magnet in it. There is a little ledge that the tip of your nail rests against to keep the magnet in place. The trick is to keep it steady for about 20 seconds and get close to, but not touch, the magnet. Here is the result. Ring finger is 1 coat to show the polish plain, which is rather matte. Everything else is 1 plain coat + 1 magnetized coat. Here is the completed hand with Seche Vite top coat. Look at this up-close because it is truly gorgeous and glowy. It reminds me of bowling balls. So cool! WOAH!!!! that is soooo koool! they dont sell that in Canada do they!?!? grr! i've been wanting to get my hands on the blue lancome polish for AGES! i was so angry when i found out they werent gonna b released in the u.s.! Those nail polishes look amazing! I had never heard of such polishes until this post. I wish they were more readily available or I would definitely go pick some up. that's such a cool idea! 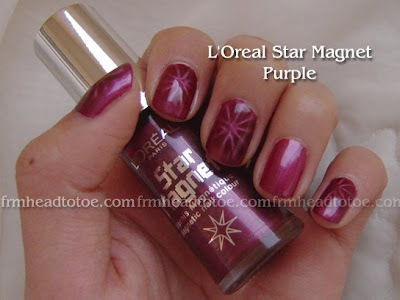 makes the nails look sooo pretty with the star on there. P.S - Has anyone ever told you that you look like Kim Yoo-Jin ? I kind of see the resemblance! I gave you an award! Come check it out! 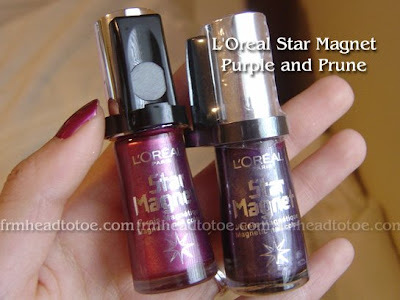 i need to checkout loreal coounter for this lil magical beau! thanks for the intro and demo..
Oh my! If anyone's doing a custom purchase, I'd definitely be interested as well! Woah you were so lucky to grab a couple of these! D: I fell in LOVE wihth the blue Lancome one when I first saw it on thenailpolish addicts blog ><. WOW...is it tool late to get a bottle of this, or would anyone in Europe be so kind as to purchase a bottle or two for me??! I love purple, and a dark red would be beautiful too!!! I am looking everywhere to find nail polish that has little star sequins in it...if anyone knows of THAT, please tell me! Is there anyone that would be so kind to sent a bottle to the Netherlands?? ?